When deciding to re-decorate your room, the first problem encountered can easily be the wallpaper hanging on your walls and how to remove it. This annoying problem stands in your way before you can even contemplate opening a tin of paint or wall filler. That's why even a cheap wallpaper steamer can cut down on the prep time for wallpaper hanging. Depending on how old your house is or how many layers of paper you need to remove paper this can be a frustrating time-consuming, arduous task. Many houses have two layers of paper to remove with lining paper used a lot in older properties. Its not a complicated problem as a good scraper and hot water usually solves the issue, but it’s not the simplicity of the task it’s the time it takes to remove the paper with this conventional method. Soaking the walls with hot water and waiting until the first layer of paper has soften so it can be scraped off whilst repeating the process until you reach the plaster walls can take an age. Added problems occur like needing endless buckets of water with aching arms plus the enormous time it takes, makes using a wall paper stripper or steamer the only way to get the job done in a timely, effortless manner. Unlock this tiresome job by reading our best rated cheap wallpaper steamers on the market - both online and in your local high street, exploring the pros and cons of why these cheap DIY appliances are a must for ever home decorator to eliminate this labour hungry task. 4 Should I Buy or Hire a Wallpaper Steamer? Buying a steamer or stripper to remove your wallpaper whether it’s for a small or large job can be tricky with a number of models and makes on the market, availability in both high street shops like B&Q and Homebase, Wilkinson’s or Screwfix can be confusing with a range of sizes and prices to match. 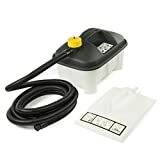 With reviews readily available online at Amazon UK it’s probably a good idea to check out the different models of wallpaper steamers and sizes, checking reliability and price before you buy. There are many different brands available including the current best selling models that get the highest reviews: Oyla Professional Wallpaper Stripper, Nitaar 2000w Heavy Duty Wallpaper Steamer and the Denny 2200w 5 Litre Wallpaper Steamer. Denny International being the largest of these cheap wallpaper steamers in the budget tool range for home use. They don’t have the multi selection of different sizes and attachments available and are at the lower end of the market making them a cost-effective alternative for a small decorating job. Both in home and professional cheap wallpaper steamer German manufacturers are rightly credited with quality and reliability, these qualities are reflected in the most popular brands Wagner and Earlex. Making steamers for the DIY market these two brands can cater for any job whether you are stripping wallpaper from a box room or a ballroom. Their budget ranges don’t break the bank but do offer the reliability of a big-name brand German brands. litres to 5 litres, with two different power models. They have a striking design in black and bright yellow with a good sizes steam plate on all models. This is a middle of the range Wagner wallpaper steamer with a 3.7 metre hose and 4 litres water reserve for uninterrupted steaming, it has a clever valve system that allows for safer steaming and a good heat insulated hose for safety, this feature alone is almost worth giving the W15, the best wallpaper steamer award for 2019. The water reservoir on the Wagner W15 steamer is clear so you can see exactly how much water is left with a kettle style lead complete with UK plug, so its ready to use straight out of the box. 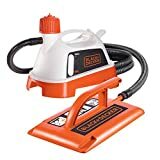 This model has good reviews for reliability and ease of use with an additional plus of being able to buy other attachments to use as a steam cleaner. The only minor issue with this model is that the hose can get quite hot and the steam plate can spit a little when warming up, although these are universal small issues with most wallpaper strippers. Good sized water tank plus steady steam rate. Only water – No chemicals required. Great value budget wallpaper steamer. Careful with the hose as it can sometimes get hot. Wagner’s premium DIY wallpaper steamer, more powerful than its predecessor with a 5-litre water reservoir and a larger heating system making the water boil faster and in larger amounts than the W 15 model. The steam plate has a good-sized handle for easy use and has 4 different configurations making it suitable for most areas that need wallpaper removing. This more powerful model has the benefit of removing many different types of paper including multi layered, painted and some Artex. A good safety feature of this model is an automatic cut-out when the water runs low preventing overheating, the only negative comments we can add is there is not an off switch for complete control. 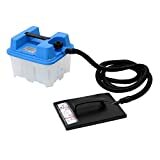 Larger 5 Litre water reservoir. Automatic cut out when water runs out for safety. Stable & well designed with a long hose. Boasting over 8 million wallpaper steamers sold, Earlex has a wide range of budget DIY to professional tools, they cater for both home and professional decorators with a high powered massive 7.5 litre water chamber wallpaper stripper, for the serious professional decorator. With the companies background It’s easy to see why they could have the perfect wallpaper steamer for every job. The Warrior cheap wallpaper steamer is a budget range tool, with a good-sized water chamber holding up to 4 litres and fast 12-minute steam time to help speed up your decorating, a basic steamer for medium to smaller sized jobs. Perfect for the first-time decorator on a budget, an easy to use lightweight tool that simply get the job done. All types of wallpaper removed with ease. Low Cost – Cheaper than Hiring a professional steamer. Fast 12-minute steam time warm up. Slightly annoying safety feature which stops you filling up quickly. This is a larger 5 litre home wallpaper stripper which boasts a revolutionary new way to remove wallpaper using a unique steam system. Lightweight design making removing wallpaper effortless with the help of the larger reservoir leading to less refills and so speeding up the wallpaper stripping process. Its easy to use and has reliable reviews complete with power lead, hose kettle and two attachments for steam cleaning. Easy removal of tough multi-layered paper. Simple setup in minutes for instant use. Quick heating time and easy storage. Only two sizes to the steaming plate. Having made your choice of wallpaper steamers you might need to have a quick read through the instructions makings sure you only fill your steamer to the correct level indicated on the side of the plastic water reservoir. Once filled plug the appliance into the power and leave the steaming plate head in a place where it can’t hurt whilst it starts to produce steam. This should give you enough time around 12 to 15 minutes to start to prepare the area you want to strip. If your paper has a top coat the best practice would be to peel this off. This can be achieved by picking at the bottom edge and pulling firmly on the paper which fingers crossed it comes off in large pieces leaving the more troublesome backing paper behind. This is not always the case especially where the paper has been painted scoring the paper with either a Stanley Knife (lightly) or the edge of a scraper can help by allowing the steam to penetrate the layers of paper below the paint. Once the steamer reaches temperature it should stop spitting out hot water and allow a constant flow of steam; at this point you are ready to blast your walls with this powerful anti-wallpaper device. There are two differing minds of thought when steaming your wallpaper. Option 1: Large areas using the larger steam pad allowing time for the water to be soaked into the paper doing around 1 metre areas at a time then stripping with your paper stripper tool. Option 2: Steam smaller areas with an on and off motion with the steamer head moving up or down the walls whilst scraping as you go. Do not to get too close to the ceiling paper as the rising steam may well lift your paper off. Wipe away large droplets of hot water that collect on the ceiling or cornice to avoid water dripping on your head! Should I Buy or Hire a Wallpaper Steamer? It requires ordering for a particular day collection in most cases and returning in a timely fashion, it may not be a huge cost and deposits are returned when your time is up but generally speaking these costs and conditions far out weight the cost of a budget wallpaper steamer. The cost of hiring a wallpaper steamer is usually more than a budget stripper purchase with UK tool hire stores HSS hire and Jewsons only offering professional machines for hire. You may consider buying a better quality stripper if you intend to have a complete home makeover or just prefer to buy a professional style wallpaper steamer for future use. Sometimes these can be family acquisitions used over many years in many rooms a quality product would be a better solution for extended family use, Earlex has a top end range for professional steamers with the Industrial LCS Pro Steam Wallpaper Stripper their first level pro stripper, available both online at Amazon and their home range available at Argos on the high street. Choosing a brand that we recognise in the tool field that guarantees performance without the professional price tag undoubtedly leads to buying Black and Decker a trusted name in DIY tools. Black and Decker offer a comprehensively good Wallpaper stripper the Black and Decker KX3300T 2400W. 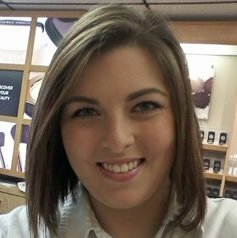 With over 300 reviews and 4.5 star rating this stripper offers a wallpaper streamer in between the budget and professional range. Large steaming plate and boil dry cut off to stop costly damage due to overheating makes this a must have home decorating accessory. 60 minutes of runtime enough to complete even a large wall before refilling. The "Rolls Royce" of budget steamers. High Steam levels for quicker stripping. Anaglypta and Woodchip painted paper removal. Large water Reservoir for longer run time. Safety release valves to prevent over heating. Reliable product - built to last. The Wagner W16 model has larger water tank. The Black and Decker KX3300T wallpaper stripper can be found on the Highstreet but generally the cheaper brands are easier to find, with the best availability and price options available at Amazon UK where as a prime customer you can have your wallpaper stripper delivered next day for free on a one-day delivery service. Buying tools for home use can be a costly affair so arm yourself with the knowledge that at least you are aware which cheap wallpaper steamer will both help you to make your decorating less stressful whilst saving you time and money instead of hiring a professional stripper. Wallpaper strippers are a great addition to your decorating armoury and with a wide range available you should be able to find the right product to suit both your budget and make your decorating a breeze. Remember, buying a UK cheap wallpaper steamer is good for one or two rooms but our rated products in this review are built to last, saving more money in the long term.